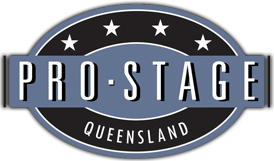 Pro-Stage Queensland is able to assist you in all aspects of staging your event. Site Management, Production Management, technical assistance and more. Our professional services are utilized by schools, sporting bodies, government departments, councils, theatre, television, music industry, film industry, corporate bodies and more. Past events have included; National Australia 150th Celebrations, Stonnington City Council events, Big Day Out, Bialik school production, Australian Gand Prix entertainment, ACDC, U2, Robbie Williams, A Day On the Green and many more. If you are just after some friendly advice please feel free to call it will cost you nothing and we will be happy to help where we can.